From Eleftherios Venizelos International Airport guests should take the Attiki road towards Markopoulo and then the next exit for Lavrio-Sounio. Following the road, after passing the town of Lavrio, the Temple of Poseidon is on the left hand side and 100 m later you will find the hotel on the right hand side. 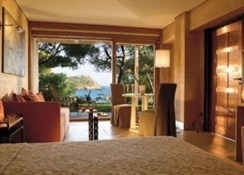 Overlooking Sounio bay and set within a pine forest, Cape Sounio, Grecotel Exclusive Resort offers private sandy beaches, a state-of-the-art spa and gourmet dining in luxurious settings. 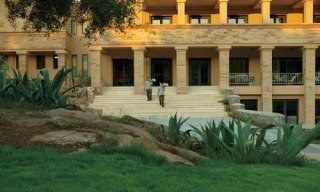 The resort features terracota-coloured bungalows and private villas set amidst stone-paved paths and olive trees. 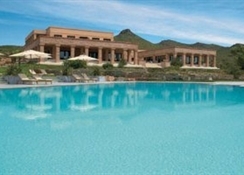 They offer spacious living and dining areas, while most enjoy spectacular sea and pool views. In-room facilities include a satellite TV, DVD player and bathrobes. 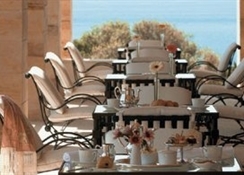 Elixir Spa is set on a cliff overlooking the sea. Apart from the indoor pool, the saunas and the gym, the spa also offers a juice bar, a restaurant and a beauty salon. Cape Sounio offers a variety of restaurants with spectacular views of the Temple of Poseidon. Dining options include Greek and international cuisine, Cretan dishes made with organic products, creative Asian delicacies and fine seafood. Athens International Airport is within 40 km. The small coastal town of Lavrio is just 10 km away. The resort also offers private yacht cruises to the neighbouring islets. It is hotel policy that gentlemen are kindly requested to wear long trousers in all areas of the hotel.